Agrotechnomarket.com - Nowdays, in the field of agriculture farmers are facing many problems such as soil fertility and in watering their plants. It’s because they don’t have proper idea to create an agriculture innovation especially for the availability of the power. Even if it is available, they need a lot of time to water by hand or to pump water and wait until the field is properly watered, which compels them to stop doing other efforts– which are also important for them, and thus they loss their precious time and other efforts. Here is a simple method more useful in watering plants automatically without any human interference. Farmers may call it as Automatic plant irrigation system. An automatic plant irrigation system not only helps farmers but also others for watering their yields or plantation as well. Automatic irrigation is the use of a device to operate irrigation system so the change of flow of water from one bay, or set of bays, to another can occur without the irrigator. 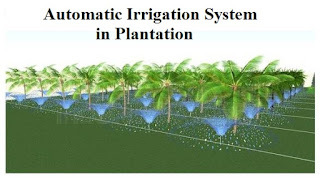 So when the farmers go to vacation or often forget to water plants, they do not afraid because Automatic irrigation system will pour the water on to the plantation. This project is a good solution If the farmers have a busy schedule, they will appreciate being able to work in the garden at the same time as the plants are being watered. As a result, there is no a chance to get the plants damaged because of dryness. to cut off the flow of water from one irrigation area – either a bay or a section of channel and directing the water to another area. These changes occur automatically without any direct manual effort, but the farmer may need to spend time preparing the system at the start of the irrigation and maintaining the components so it works correctly. This automatic plant irrigation system senses the moisture content of the soil and automatically switches the pump when the power is on. A usage of automatic plant watering system is very important because this system is very useful in all climatic conditions. The system can cover shortage of land reserved water due to lack of rain and unplanned use of water as a result large amounts of water goes waste. Improving irrigation system can contribute greatly to reduce production costs of agricultural products, making the agriculture industry more competitive and sustainable. Through automatic irrigation system, average crops can be maintained (or increased) while minimizing environmental impacts caused by excess applied water and subsequent chemical fertilizer leaching. Recent technological advances have made soil water sensors available for efficient and automatic operation of irrigation systems. Automatic soil water sensor-based irrigation seeks to maintain a desired soil water range in the root zone that is optimal for plant growth. As the irrigator is not required to constantly monitor to check the progress of an irrigation, the irrigator is available to perform other tasks – uninterrupted. Because of that, the farmer is able to be away from the property, relax with the family and sleep through the night. In addition to, the reduces for the running costs of vehicles are used to constantly check progress down the bays being irrigated. More timely irrigation: Irrigators with automation systems are more inclined to irrigate when the plants need water, not when it suits the farmers. This the difference between hand watering and automatic system, it can take substantial time and early morning and evening watering rituals take away from family and effort. Automatic plant irrigation systems have timers that can be preset for daily or weekly watering so the farmers do not need to check the watering because the timer shuts the water off when it has finished. Helping in the management of higher flow rates: Many farmers are looking to increase the irrigation flow rates they receive through installing bigger channels and bay outlets. Such flow rates generally require an increase in employee as the time taken to irrigate a bay is reduced thus requiring more frequent change over. Automatic plant system irrigation allows for these higher flows to be managed without an increase in the amount of employees. More accurate cut-off: Automatic plant irrigation system allows cut-off of water at the appropriate point in the bay. This is usually more accurate than manual checking because human error can occur if the operator is too late or too early in making a change of water flow. Reduced runoff of water and nutrients: Automation can help keep fertilizer on farm by effectively reducing run off from the property. Using automatic plant irrigation system produces smaller droplets, helping to preserve nutrients and reducing runoff of water. Retaining fertilizer on farm has both economic and environmental benefits. Highly Cost: There are costs in purchasing, installing and maintaining automatic equipment of irrigation systems. In addition to, there is a need to increase maintenance of channels and other tools to ensure the system works correctly every time. Channels should be fenced to protect the automatic units from stock damage therefore a lot more costs to maintain perfect growing conditions. 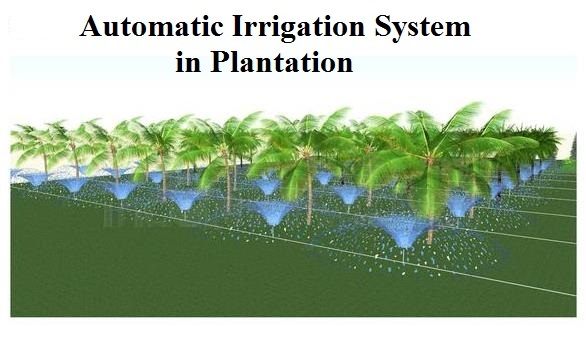 0 Response to "Automatic Plant Irrigation System in Plantation"